Can a gal ever have too many pouches? I think not. Especially if it’s made with clear vinyl, which just happens to be uber trendy. Plus it happens to be uber practical because I love being able to see what’s in my purse at a glance. 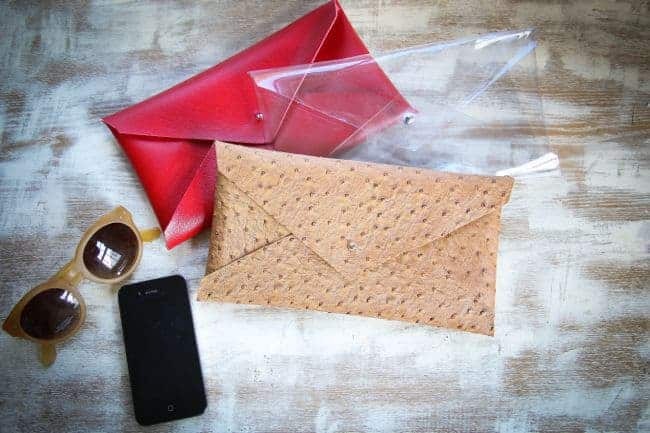 I’ve seen tiny no sew pouches for business cards, and thought, wouldn’t that be awesome as a clutch? After a bit of playing around, I came up with a pattern that’s big enough to make a clutch for when you don’t want to carry a purse. But it’s also small enough to keep in your purse for make-up, diapers, whatever. Bonus! Small piece of vinyl. Clear vinyl is the easiest to work with – and you want to buy the thickest weight vinyl. The pattern also worked well with 2 other old pieces of vinyl (the red and the animal print). Step 1: Draw out the pattern on the vinyl and cut. Step 2: Fold in the outer flaps and mark where they overlap with a pencil. Step 3: Fold up the bottom flap and mark where it meets the side flaps with the pencil. Step 4: Cut a tiny hole at each of the 3 marks with your scissors. Starting from the inside of the pouch, insert the button stud. Put the stud through the side flaps first and the bottom flap last. Then screw in the back of the stud. Step 5: Fold down the top flap and cut a small hole where it meets the stud. This will be your closure. If the sides of your pouch are sticking up, press them down with a book for a day or so. Then have fun picking out stylish accessories to put in it. hi I love the pattern but it sees there is a typo n the pattern as the length should be 14 inches rather than 12 inches total. thank you. I love this and want to make it for my mom. I don’t know if I can find vinyl here but I will try (am in Mexico). I have a doubt about the button part, I am not sure how that worked and am not sure how you keep the bottom three layers together and then the top one when you close it how does it stay closed? What size is your pouch? Thanks! these would be great for traveling-TSA could clearly see what’s in your carry-on. thanx ! Stephanie, what is the thickness of the vinyl that you are using? I love making projects with Vinyl! I have been wanting to make a clear clutch, this one is adorable. This would be great for the new NFL handbag restrictions! Maybe a bit larger & add a chain! Thank you for the inspiration! Love that idea! Have fun making one! Amazing! I love this & it looks like a pretty quick project. Hey, maybe even *I* could manage this one! I adore the clear vinyl pouch and makeup bags, especially in neon colors. Now I’ll have to be on the hunt for some vinyl. Thanks so much for sharing your lovely pouch tutorial! You can find vinyl at JoAnn’s in the home fabric section – they have lots of fun neon colors too! 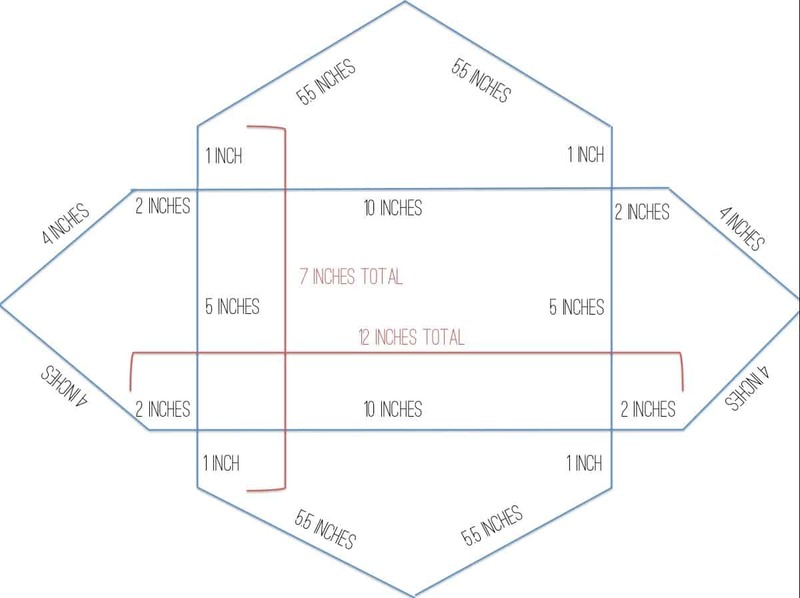 I think the measurements on your template are off. It says 12 inches total across but shouldn’t it be 14? You’re right! Good catch Jessica. Apparently I can’t add :) I’ll update the template! Where can I buy the vinyl from? Great question! I got mine from JoAnns – they had several different thicknesses to choose from. this looks too easy to be true!! 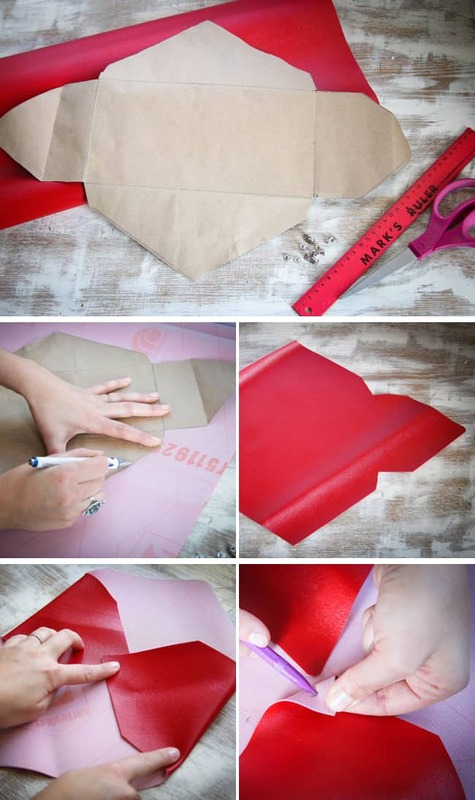 What a fun idea – great tutorial! I love this idea… so simple and chic! Yet another brilliant idea from you Stephanie! I love that you could have one to match every outfit! This is SO brilliant. I’m going to add this to my list of things I need to do. Pinning this ASAP. 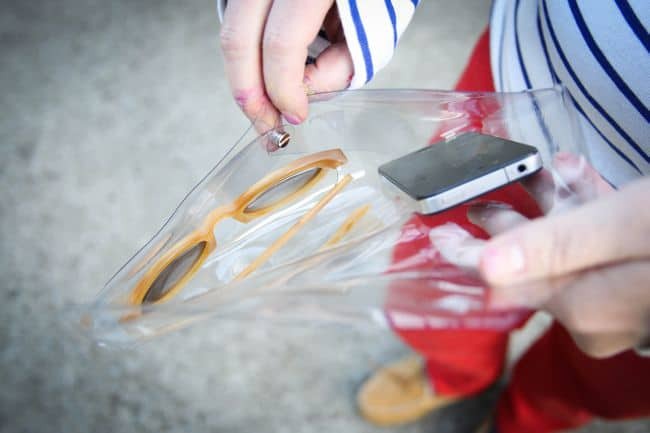 It always takes me FOREVER to find anything in my purse, so I need to make this with the clear vinyl :-) Love this idea! This is genius. I love the clear one so much!